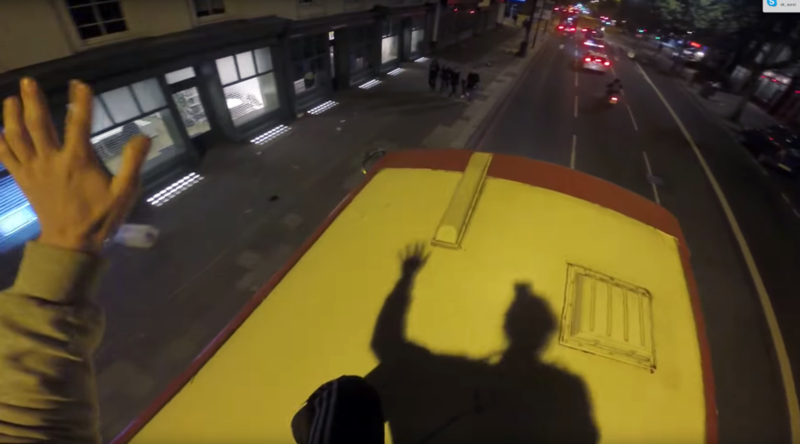 A thrill-seeker who filmed himself riding on top of a 14ft double-decker bus around London has been labeled “idiotic” by transport authorities. The footage, filmed on a head-mounted camera, was uploaded to YouTube by an “urban explorer” who posts daring videos to social media under the name DyingLlama. The stunt, part of a new “bus surfing” craze, shows the man climbing a tree before jumping on to the bus’s roof while it is stopped, clinging on as it makes a journey around Elephant and Castle. When the bus is stopped in traffic, the man gets up near the front edge of the bus, laughing and waving to people on the footpath below. The footage ends with him scrambling down the side of the bus to safety. A man waiting at the bus stop looks shocked as the ‘surfer’ drops down in front of him. Transport for London (TfL) called the stunt “idiotic,” and Metropolitan Police say they are investigating. “Police are aware of this video and are looking into it,” a Met police spokesperson said. The clip has been viewed more than 200,000 times. A note under the video plays tribute to photographer Christopher Serrano, who died on Wednesday in New York while trying to trainsurf near Brooklyn. According to New York Magazine, the 25-year-old was renowned on Instagram for his daring photos taken atop skyscrapers. “It’s a very good reminder that despite how easy and fun this stuff looks, it’s extremely dangerous and shouldn’t be recreated,” DyingLlama posted. DyingLlama has posted similar clips showing stunts including climbing across rooftops and on the 02 Arena.